In just six short days, Sony Pictures will release their orignal sci-fi drama Passengers, written by Jon Spaihts, whose original script debuted on The Black List, featuring the most popular unproduced screenplays, way back in 2007. While its journey to the big screen isn't quite as long as the 120-year journey Jim Preston (Chris Pratt) and Aurora Lane (Jennifer Lawrence) have to endure in this movie, it seems that the final product is not a critical hit. The first reviews started going up today for Passengers, and the results do not bode well for this movie. As of now, Passengers only has 12 reviews posted on Rotten Tomatoes, but of those reviews, only two are positive, with the movie posting an initial Tomatometer score of 17%. For those who are hoping for a comeback of original material, instead of the remakes, reboots, sequels and adaptations that have dominated the cinematic landscape as of late, the early panning of Passengers is not a good sign. Even one of the two positive reviews isn't all that glowing. Here's an excerpt from Scott Mendelsohn's positive review of this sci-fi drama at Forbes. "Nonetheless, Passengers works as flashy, adult-skewing popcorn entertainment that stands apart from the pack. It has moments of action and peril, but it is mostly a drama that evolves into a grim romance that quite commits to being "about" its most interesting subject matter. It works because the film is gorgeous to look at, because its two top-billed stars command our attention, and because it achieves enough of a rooting interest so that we care about the outcome. It starts better than it ends, and it gives short shrift to its most interesting subject matter, but it is good enough as a Saturday night at the movies option." After landing on The Black List, Passengers entered what seemed to be an endless development process that featured a number of stars and filmmakers coming and going. At first, Keanu Reeves and Reese Witherspoon were attached to play Jim and Aurora, with Gabriele Muccino directing. Eventually, Rachel McAdams replaced Reese Witherspoon, with production slated to take place in 2014, under the direction of Game of Thrones director Brian Kirk. Then The Weinstein Company dropped the film altogether, leading to Sony picking it up and setting Morten Tyldum (The Imitation Game) to direct, which is when Jennifer Lawrence and Chris Pratt became attached. The one constant throughout this process was Jon Spaihts' script, and according to The Hollywood Reporter's Sheri Linden, the story might have worked in the hands of a different director. "There is, at first, a thrilling what-if in Jon Spaihts' screenplay, which concocts a sort of Titanic in outer space, with dollops of Sleeping Beauty and Gravity thrown into the high-concept mix. Under less shiny, by-the-numbers direction, the story might have soared, or at least been more stirring. Yet while Passengers offers a few shrewd observations about our increasingly tech-enabled, corporatized lives, its heavy-handed mix of life-or-death exigencies and feel-good bromides finally feels like a case of more being less." Chris Pratt's Jim Preston and Jennifer Lawrence's Aurora Lane are just two of 5,000 Passengers on a 120-year journey to a new home, with everyone aboard sleeping in suspended animation. Jim and Aurora are awakened 90 years too early when their ship malfunctions. As Jim and Aurora face living the rest of their lives on board, with every luxury they could ever ask for, they begin to fall for each other, unable to deny their intense attraction... until they discover the ship is in grave danger. With the lives of 5000 sleeping passengers at stake, only Jim and Aurora can save them all. Despite this high-concept plot and the casting of two of the biggest movie stars in the world, EW's Chris Nashawaty didn't pull any punches, calling Passengers "pretty bad." in his review. "The signs to be hopeful were all there: A pair of dependable movie stars, a bullish Oscar-season spot on the release calendar, a director hot off of an Oscar-nominated film. But alas, Passengers is not very good. In fact, it's pretty bad. 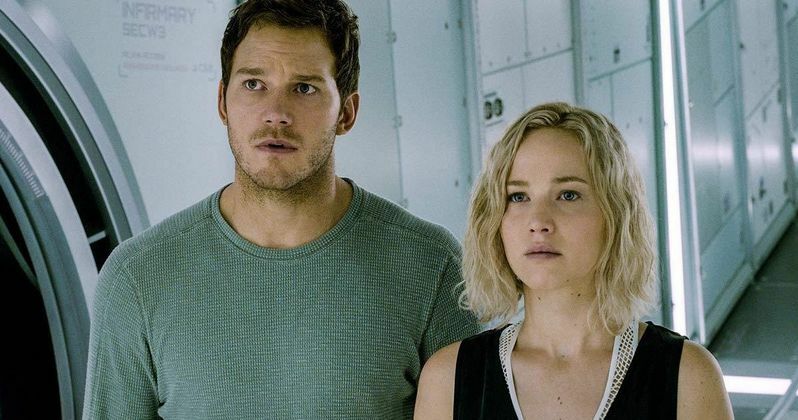 The studio is positioning this new Chris Pratt-Jennifer Lawrence sci-fi flick as a sort of Adam-and-Eve riff on The Martian... That's the way the trailer makes it seem, at least. And I'll be honest, that's a movie I'd kind of want to see. But that's not what we get. Not even close. Passengers is way stupider than that." Indiewire's Kate Erbland also takes the movie to task for its "icky questions of consent that run through its central narrative," which are "brushed aside by the film's iffy conclusion". She does go on to praise Jon Spaihts for his "world-building" and Jennifer Lawrence and Chris Pratt for their "charming repartee," while adding that the film should be much more entertaining than it actually is. Most of the critics seem to not have any issues with how the film opens, but have plenty of issues with the ending, with Variety's Owen Glieberman also contending that Morten Tyldum simply was not the right filmmaker to tackle this story. Here's what he had to say below. "Passengers" is the tale of a lonely guy in space, the drama of an ethical conundrum, a love story featuring two of the hottest actors on the planet, and a turbulent sci-fi action-adventure - and for all of that, it manages to be not a very good movie. The two stars, Jennifer Lawrence and Chris Pratt, are both intensely gifted and easy on the eyes, and the film takes off from a not-bad idea, but the setup is way better than the follow-through. (The Imitation Game director Morten Tyldum) turns out to be the wrong filmmaker for an amorous space opera." Most critics also pointed out that Passengers doesn't belong in the same arena as recent sci-fi hits such as Gravity and last year's The Martian, with The Wrap's Robert Abele stating that, when compared to both of those movies, "Passengers winds up a thoroughly misguided rocket to nowhere." Aside from this critical drubbing, Passengers will also have plenty to contend with on the big screen, opening alongside Assassin's Creed and the animated musical Sing, and arriving just five days after the highly-anticipated Rogue One: A Star Wars Story. Passengers was reportedly made under a $120 million budget, so we'll have to wait and see if this critical drubbing leads to Passengers being a commercial flop.